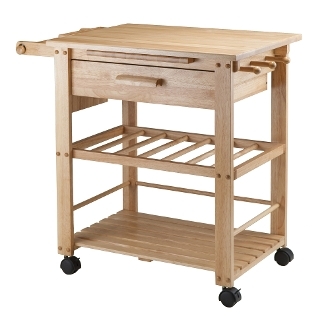 The ultimate kitchen cart, the Natural Finland cart provides bevy of storage options and a spacious workspace. Hide utensils and cutlery in the deep drawer, keep wine bottle safe and sound on the rack, towels on each hooks, knife block keeps the knives safe then storage plates and glasses on the bottom shelf. Durable casters allow you to easily move the cart. This compact kitchen island is ideal for a small kitchen that needs more workspace. Shelf is 21.1"W x 15.9"D. Drawer inside dimension is 19.75"W x 13.5"D x 4.3"H. Overall cart dimension is 35"W x 20.5"D x 31.5"H. Constructed of solid and composite wood in natural finish. Assembly required. Overall cart dimension is 35"W x 20.5"D x 31.5"H. Bottom shelf surface is 21.1"W x 15.9"D.
Top surface is 27"W x 20.4"D. Drawer inside dimension is 19.75"W x 13.5"D x 4.3"H.
Comes with knife block and holds 4 bottles of wine. Solid and composite wood. Assembly required.